Innovation Unleashed engages curious people who love discovering the “what’s next” in technology solutions to help all of us live better lives. 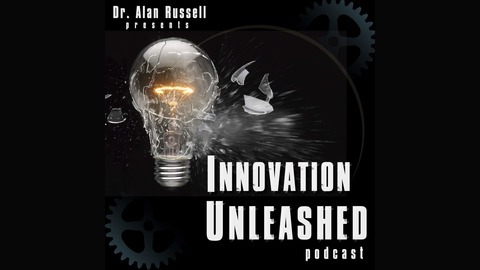 Hosted by Dr. Alan Russell, an innovation expert who has appeared on Rolling Stone Magazine’s list of the Top 100 People Who Will Change America, listeners will meet a variety of innovators who will talk about how innovation and technology will shape the future and impact the way that we live. We will be discussing things like driverless cars, robot surgeons, artificial intelligence, 3D printed organs…disruptive technologies destined to play a significant role in the future of humankind. 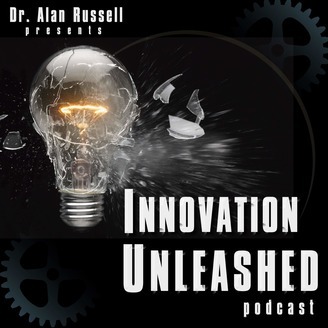 At the beginning of each episode, I remind listeners that innovation is a team sport. Our own Andrew Carnegie once said, “Teamwork is the ability to work together toward a common vision. The ability to direct individual accomplishments toward organizational objectives. It is the fuel that allows common people to attain uncommon results." From the time that we are young, we are organized into teams for school, fun and friendship. We are taught to “play nice,” share, and get along with others. We are grouped into small teams for learning, we participate in team sports, join scouts and join together to cheer on our favorite competing footballers and soccer stars. We all make the assumption that good teamwork is essential for good outcomes in life. We believe that people perform well when they work together in groups because it creates a medium through which people can discuss, debate and collaborate about various issues regarding the achievement of their group goals. Working together also creates mutual understanding and a sense of belonging, which further enables commitment to the success of the entire group. Over the past 60 years, as technological, scientific and social challenges have become more complex and scientific understanding, research and methods have advanced, researchers have increasingly combined with colleagues in collaborative research referred to as team science. At places like Carnegie Mellon University, it is common practice to work not only across the campus with collaborators, but to also reach out all over the world to find scientists that are interested in working on teams to solve big problems. According to the National Academies of Sciences, Engineering and Medicine, 90 percent of all science and engineering publications are authored by two or more individuals and the size of authoring teams has grown as individual scientists, funders, and universities have sought to investigate multifaceted problems by engaging more individuals. Most articles are now written by between 6 and 10 individuals from more than one institution. We are fortunate to be joined on this episode by a renowned expert in the study of teams and collective intelligence. Anita Woolley, is an Associate Professor of Organizational Behavior and Theory at the Tepper School of Business, Carnegie Mellon University. She has a PhD in Organizational Behavior from Harvard University, where she also earned Bachelor’s and Master’s degrees. Her research and teaching interests include collaborative analysis and problem solving in teams; online collaboration and collective intelligence; and managing multiple team memberships. Her research has been published in Science, Organization Science, Academy of Management Review, Journal of Organizational Behavior, Small Group Research, and Research on Managing Groups and Teams, among others. Her research has been funded by grants from the National Science Foundation, the U.S. Army Research Office, and private corporations. She is a Senior Editor at Organization Science, Academy of Management Discoveries, and Small Group Research, and is a member of the Academy of Management, the Interdisciplinary Network for Group Research, and the Association for Psychological Science.